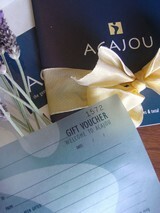 Gift vouchers for that someone special. Gift vouchers are an excellent way to introduce a friend or that someone special to the benefits of beauty therapy. We can tailor-make a package to suit every individual. Vouchers are available for any treatment or value – you choose! Show that special someone how much you care. Email us now or contact us by telephone.